J.F. White-Schiavone, JV Photo Currently the J-V crews are working at night — 7 p.m. to 5 a.m. and once the demolition work begins, there will be two shifts — 7 a.m. to 3:30 p.m. and 3:30 p.m. to midnight. 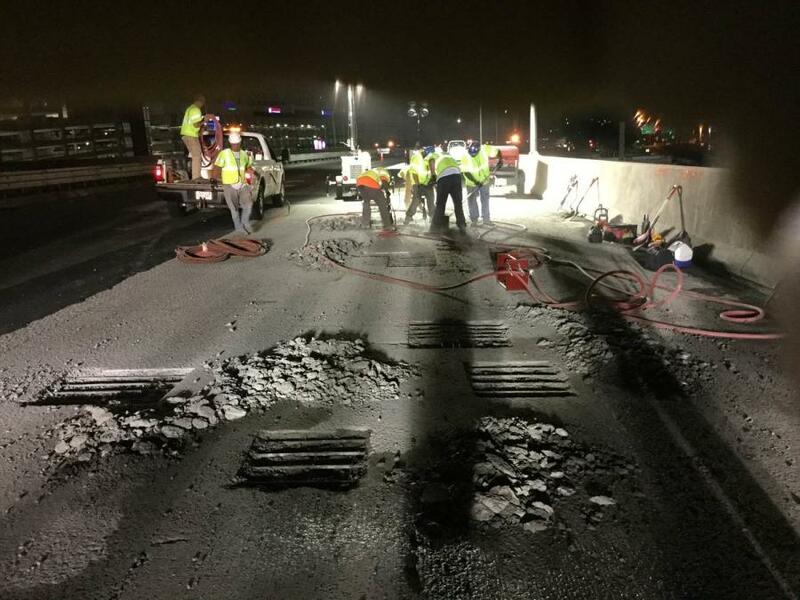 The contract for the much-needed rehabilitation of the I-91 Viaduct Rehabilitation Project in Springfield, a $183.3 million Massachusetts Department of Transportation (MassDOT) initiative, was awarded to the joint-venture (J-V) of J.F. White Contracting Co. and the Schiavone Construction Co. LLC last April, and the work is progressing well. The project covers a lot of ground from I-91 northbound and southbound, just south of State Street to the I-291 interchange ramps, and the work covers various on- and off-ramps between these limits and the I-291 ramp structures. The J-V submitted the lowest price for the project (of which three bids were submitted) — $148 million making JF White-Schiavone the low bidder for the project. When the costs of railroad flaggers, traffic details, protections against cost overruns and an incentive clause for the contractor to expedite the work are included, the project will cost approximately $183.3 million. Federal Highway funding is covering 80 percent of the cost, with state covering the remainder. The contract terms include an incentive of $50,000 per-day for each day that the contractor completes the work early — a maximum of 180 days. There also is “a disincentive clause” that penalizes the contractor $50,000 for each day the work continues past the expected point where drivers should be expected to have full, beneficial use of the corridor. Thomas J. Tinlin, MassDOT highway administrator re-iterated the need for the work. The first phase includes utility work, intersection improvements and bridge deck repairs with nightly lane restrictions and early on MassDOT is taking the lead on trying to speed up construction. Sunday through Thursday nights through fall 2015, lanes on I-91 north and/or southbound will be closed to allow the contractor to mill out the existing pavement and repair the concrete deck. 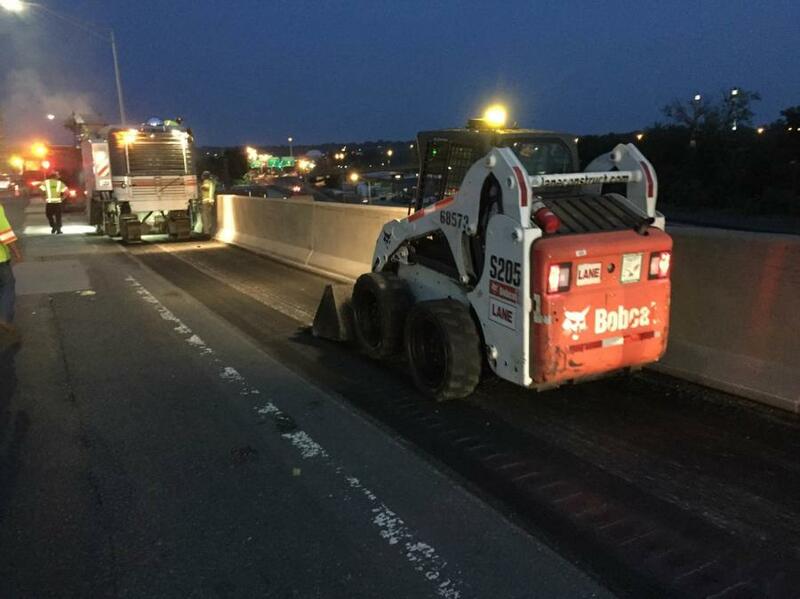 MassDOT is taking traffic management seriously for the multi-year project, with regional traffic to be maintained on the existing bridge and local traffic on the surrounding city streets. Various ramp closures are being planned for I-91 and I-291 and new speed limits are being implemented to help protect the construction crews. MassDot also engaged in a major public-information campaign to ensure that commuters and businesses are fully aware of the scope of the project and the safety measures that are being implemented. Bob Murphy, the joint venture's project executive and a vice president with J.F. White, noted that there is only one construction season. The crews are in the beginning phase — the pre-emptive repairs phase. 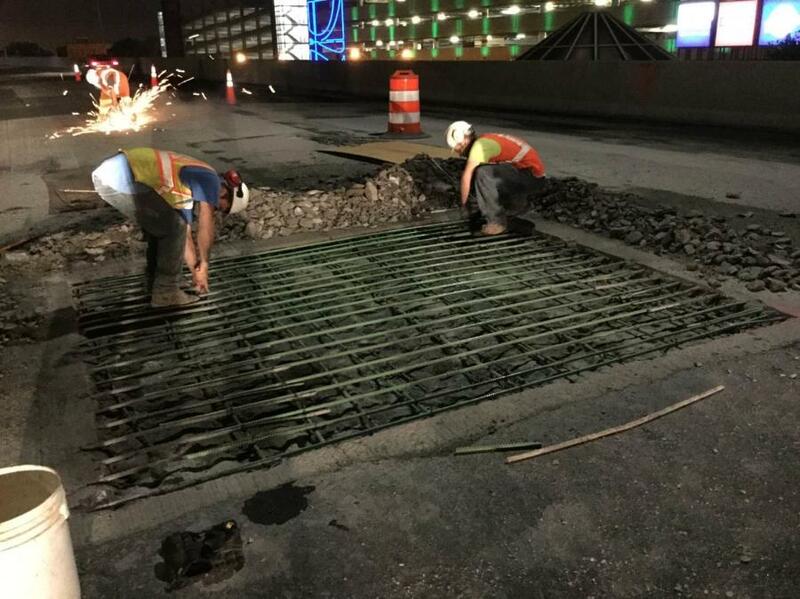 Starting in December, J-V crews will start taking the deck off the southbound lanes — 48 individual spans, a process that will take three to four months. When the 4,800-ft.-(1,463 m) long bridge project is delivered, J-V crews will have removed 30,000 tons (27,216 t) of concrete, 3,500 tons (3,175 t) of rebar and 1,200 tons (1,089 t) of asphalt. In terms of new materials, 15,000 cu. yds. (11,468 cu m) of concrete, 3.5 million lbs. (1.6 million kg) of rebar, and 200,000 lbs. (90,718 kg) of structural steel will be brought in. Bringing in construction materials also will be a challenge. Currently the J-V has 90 people on site, including subcontractors, and this number will increase to more than 200 in the spring. Among the main subcontractors are those responsible for the painting and the steel erection and repairs. The new deck will not be widened or lengthened. Below the deck are mainline tracks operated by CSX Transportation, Pan Am Railways, Inc. and Amtrack, an area known as the Diamond Interchange, which has tracks going in all four directions. Murphy's crews will be installing a 100-percent containment shield within the next three weeks. The hours for this erection will be determined by the railways, which have collaborated to appoint one person to be their point of contact with contractor and MassDOT. “Once we get the containment shielding up and everything is protected,” said Murphy, “we can work whenever we want. We'll be working with the railway flagmen until the system is erected. They set up a good package with this one point of contact. We understand the coordination and we're not scared by it. We may get a call saying ‘you have 1.5 hours to get out there and do some work' and we're ready to jump on that opportunity. Communications between MassDOT and the J-V are solid. Murphy appreciates the traffic measures that MassDOT has brought in to protect the construction workers and public. “They legally lowered the speed limit and it's a big procedure to get a legal one done,” he said. “When you have a speed limit posted on orange signs, those are just recommended and not enforceable. But they made this area enforceable — 40 mph and a couple of nights ago, the police pulled over a couple of tractor-trailers in the work zone that were doing 75 mph. Ralph Romano, resident engineer for the MassDOT Highway Division, has a staff of seven engineers and inspectors. Currently the J-V crews are working at night — 7 p.m. to 5 a.m. and once the demolition work begins, there will be two shifts — 7 a.m. to 3:30 p.m. and 3:30 p.m. to midnight. J.F. White is providing the majority of the workers and equipment. Schiavone Construction is focusing its efforts on management and supervision, steel repairs and deck reconstruction. Equipment-wise, the J.V. is employing Cat and Volvo excavators, loaders and backhoes for the roadwork and intersection improvements. For the demolition, which will be done by hand, a variety of jackhammers will be used, along with Bobcats and small dump trucks for the cleanup. Onsite mechanics will be brought in later as the work escalates. J.F. White's closest equipment yard and shop is two hours away in Stoughton, Mass. Mechanical help is provided by mechanics sent to the site and by dealerships in the Springfield area. Murphy, who has been in construction for 38 years, has some bridge work experience, but not on this scale. Assisting Murphy are Chris Pehl, the project's superintendent and Tim Goodridge, project engineer.